Former U.S. Ambassador to Uruguay Julissa Reynoso ’01 delivers keynote at 3rd annual gathering. 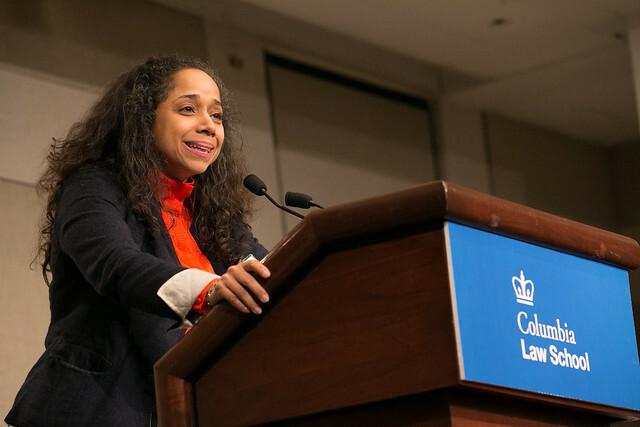 On April 16, Columbia Law School hosted the third annual Alumni of Color Talk and Reception at the Harold Pratt House & Peterson Hall on the Upper East Side of Manhattan. The featured speaker was Julissa Reynoso ’01, an adjunct professor of law at Columbia and a partner at the firm Winston & Strawn, where she specializes in international arbitration, international litigation, and complex commercial litigation. Reynoso discussed the rewards of having a career that incorporates private practice and public service, including her time as the U.S. Ambassador to Uruguay and Deputy Assistant Secretary of State for Central American, Caribbean, and Cuban Affairs. At the inaugural Alumni of Color event in March 2016, George W. Madison ’80 delivered the keynote address. Madison is spearheading an ongoing campaign to raise $1 million for the Eric H. Holder, Jr. Scholarship Fund to finance the education of deserving minority students.